Is It Time to Stay or Go? Do you wonder whether sticking with your current job will take too big a toll on your sanity? Staying may have its financial rewards, but it’s not doing you — or the company — any good if you’re miserably unhappy or chronically undervalued. In fact, some CEOs are offering to pay employees to leave if they’re not interested in staying. Job satisfaction is an elusive goal for many working Americans, especially when you add quirky bosses and coworkers to the mix. We all know that office politics come with every job. Still, there may come a point when the situation is unsalvageable. On the other hand, leaving too early may hurt your long-term career prospects. How do you figure out whether to stay or go? Carefully consider the plusses and minuses of leaving, preferably during a calm moment (and without a drink in your hand). When you took a position below your skill level just to get your foot in the door, you thought that by now, months later, others would have recognized your talents. But the creative team won’t give you the time of day, and you’re stuck with all the lowly tasks. You’ve even mentioned you have an inside source at the company they’re wooing as a new client, but no one deigned to follow up. They’ll never tap into the skills you bring because upward mobility at this company doesn’t extend to clerical personnel. When it seems the door is closed on making any upward progress, schedule time for a heart-to-heart talk with your supervisor or department head. Find out if there’s a way to move through these closed doors. Having that chat may also help give you a more realistic timetable for your advancement. You definitely had reservations about the boss’s aggressive personality when you took the job. Still, you thought your thick skin could fend off any abuse. But having endured humiliation and ridicule as the boss’s most accessible victim, the brutality has finally gotten to you. In fact, you can no longer stand the sight of this bully! Your predicament isn’t unusual: an Employment Law Alliance poll shows nearly 40 percent of U.S. workers say they’ve worked for an abusive boss. As much as you’d like your revenge, resist the temptation. Never retaliate. But do what it takes to preserve your sense of self-worth before you get to your breaking point. First, consult the office handbook. Does it specifically cite how to handle a grievance? If not, you may want to consider discussing it with someone in the HR Department. Bear in mind, though, that tattling may also have consequences. This is not a decision to undertake lightly. Tired of propping up an incompetent boss who never shows up prepared, regardless of the hours you’ve spent laying the groundwork? Sick of having to be the messenger that tells the client your company has come up short? When you’re carrying a team of slackers on your back and know that it’s putting your own reputation at risk, it’s time to create a Pros and Cons list. What do you gain by staying? How long will it take you to find new employment? When the boss still composes on a legal pad or has an inbox of the plastic tray variety, it can feel like you’re stuck in a time warp while your competitors are moving fast-forward into the future. Bringing your aging boss out of a 20th Century mindset wasn’t supposed to be part of your job description. Still, you’ve tried your best: presenting charts and graphs to make the case for an upgrade and patiently explaining over and over again how an interactive website can improve sales and customer satisfaction. Before deciding to accelerate your search for a new position, look for an ally at your workplace who might have more sway in getting the boss to budge. We’ve all encountered people whose heads are so big they barely fit through the door. They misrepresent themselves to achieve their status, then contrive to make everyone else their underlings. Their grandiose visions for the company are unrealistic, if not absurd, but they demean anyone who offers an opposing idea. Now the narcissist detects that your allegiance is wavering, and you’ve fallen out of favor. For your own sanity and self-preservation, you may want to get out from under your narcissistic boss before you’re forced out. Is there a way to move up in the organization? Even a lateral move may accomplish miracles. It’s happened again. The company overlooked you and promoted a coworker you know is your inferior. Just like before, you’ve put on a good face while internally you cycled through the disappointment, anger and frustration — but frankly, this time you’re insulted. You know you have the skills, the passion and the professionalism to excel at the next level. You’ve even sought out your supervisor for feedback when you were previously passed by, and took that feedback to heart. Now, before resentment gets the best of you, it may be worth checking back in with your supervisor. Otherwise, it’s time to reactivate your network and look for new opportunities. Ready to make your break, so now what? When all signs are pointing to the need to move on, what then? Finding a new job can be both time-consuming and stressful. But taking that first step to make a plan and put it in place can improve your outlook and increase your prospects. Take incremental steps – Attend a networking reception. Try reaching out to industry leaders before you truly need them. Polish your online profile – Update your online profiles and extend your social media reach. Meet with an executive recruiter – Share your intention with someone who can evaluate your candidacy for your new dream position. 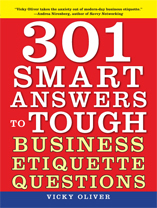 Vicky Oliver is a leading career development expert and the multi-best-selling author of five books, including: Live Like a Millionaire (Without Having to Be One) (Skyhorse Publishing, 2015) and 301 Smart Answers to Tough Business Etiquette Questions (Skyhorse Publishing, 2010). She is a sought-after speaker and seminar presenter and a popular media source, having made over 700 appearances in broadcast, print, and online outlets. For more information, visit vickyoliver.com. All Your Coworkers Are Leaving — Should You?